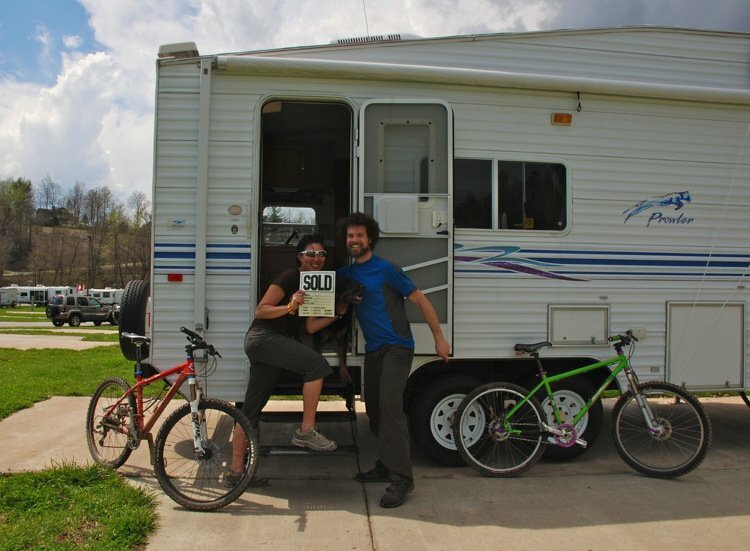 Ching and Jerud buy their first RV. When my husband and I hit the road in our late 30s we were always the youngest ones in the park by a couple of decades. Nine years later, the full-timing demographic has been turned on its head as adults in their 20s and 30s are opting for a nomadic lifestyle that was once only a privilege for the retired. What makes these full-timers even more remarkable is that many are hitting the road in refurbished towables and motorhomes painstakingly fixed up with their own hands. Occasionally, they’ll even go beyond basic renovations to create a home on wheels that aligns with their personal values. The two best examples that I’ve encountered on the road are Ching and Jerud, two thirty-somethings from Asheville, North Carolina. 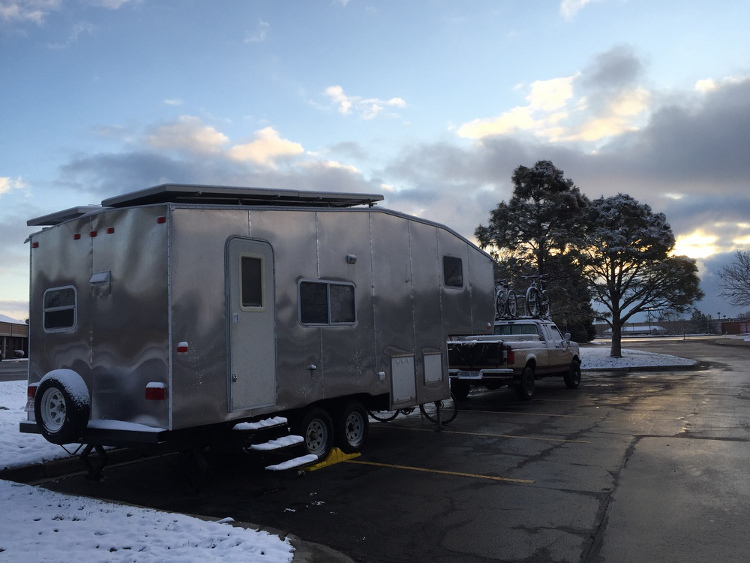 This nomadic couple turned an ordinary RV into an all-solar-powered, eco-friendly fifth wheel. Wrapped in aluminum from roof to axles, their fifth wheel is so unusual you would have to be blind not to see it as it goes down the road. Wrapped in aluminum from roof to axles, their fifth wheel is so unusual you would have to be blind not to see it as it goes down the road. If you also happen to miss the faint waft of french fries as the couple and their two dogs go past, your sense of smell is obviously impaired. Affectionately dubbed “The Toaster,” Ching and Jerud’s 24-foot solar-powered ecological wonder on wheels consumes a fraction of the energy of the typical RV. What’s even better is that neither the truck nor the rig burns fossil fuels – not even propane. “In our everyday lives we try to be as eco-concsious as we can,” they write in their blog Live Small Ride Free. “We’re not perfect and we’re probably not even great, but we believe every little effort counts. But one of the biggest downsides of traveling in an RV is fossil fuel usage. We can’t justify driving around the country burning diesel at 10 mpg. So we decided that our truck would have to be converted to burn waste vegetable oil (WVO). 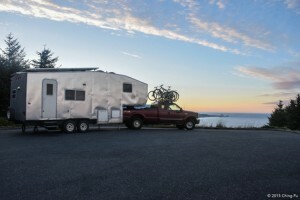 RVers like these two aren’t the norm, so locating a rig to suit their environmental choices proved impossible. Instead of waiting for the RV industry to create their dream rig, they rolled up their sleeves and did it themselves. After locating a 2001 24-5P Fleetwood Prowler and 1999 Ford F250 7.3 liters 4-wheel drive, the couple went to work and essentially rebuilt the entire rig. 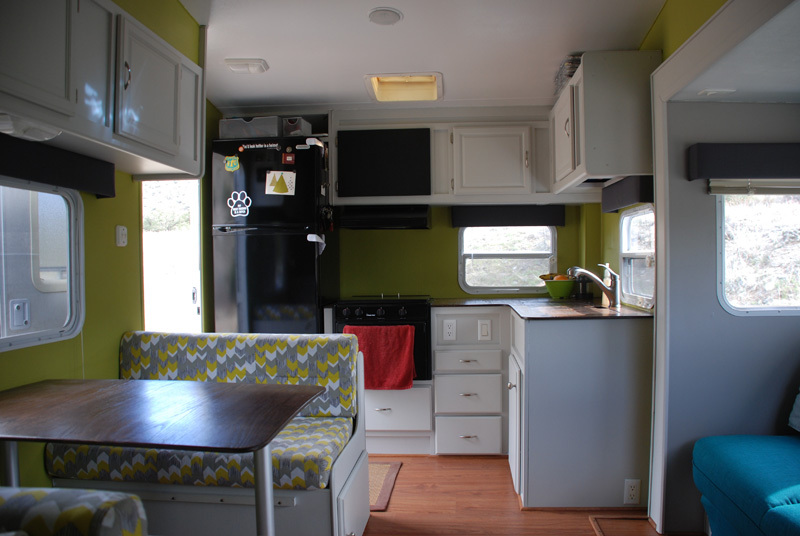 From rented storage space, they dedicated a year of their after-work lives to create the ideal solar-powered eco-friendly RV. Like all RV renovation projects there were roadblocks. After digging into the Prowler’s renovations they discovered irreparable water damage to the RV. One by one each piece of siding was removed. 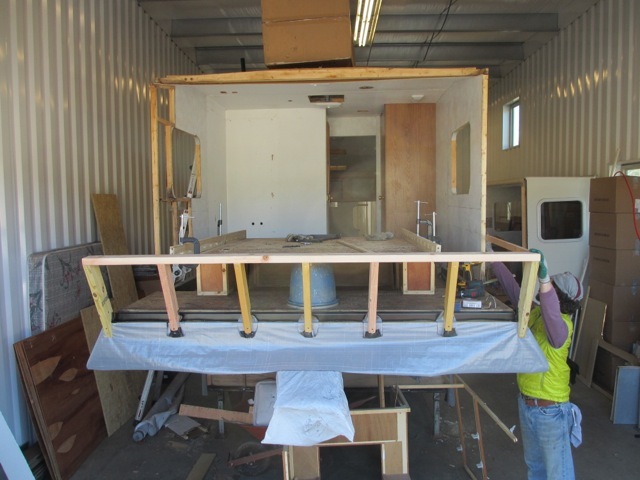 It didn’t take long until they were in the midst of a complete tear-down of the rig from inside and out, all the way down to the studs. Ultimately the surprising water damage allowed them more flexibility in how they made changes to the RV, like designing a new electrical system for their all-solar lifestyle and wrapping the exterior in aluminum. It was the most time consuming and expensive hurdle, but it turned out to be their most distinguishing feature that draws gawkers every time they roll. As a bonus it also gets a few nods from Airstreamers. “I was told that when you undertake a project such as rebuilding an RV there are bound to be lots of surprises – and they are usually the ones you’d rather not have. Except I was told this after the surprises,” writes Ching in their blog. “The Toaster” has 1220 watts of solar panels on the roof. It generates more than enough power to meet their needs, which includes enjoying the luxury of a full-sized, residential refrigerator. Their RV has no black tank. They have a composting toilet instead, which uses no water. Two small under-sink on-demand hot water heaters replaced the old unit. The entire home on wheels is powered by waste vegetable oil. Almost a year has passed since this dynamic couple has hit the road and so far they have no plans to stop. Still on sabbatical from their old careers — he as a mechanical engineer and she as a community outreach advocate for the outdoor retail industry — Ching and Jerud are happily exploring the country with their two dogs and living life on their terms. Burning grease, great lifestyle to live and very rewarding. The 7.3 is one of the best platforms to convert with a proper system. Keep it up!